My mom and my sister got me a Lodge griddle/grill and a 10″ skillet for my birthday. I’m so excited to have some cast iron cookware at my disposal now, especially a griddle and grill! I spent most of yesterday seasoning it (they came “foundry seasoned” but I’ve read they can use a bit more before the first use) so I could make my first dish, grilled tofu. The recipe for the tofu is from Vwav, so I don’t have a recipe to post. If you don’t have the book (buy it already!) 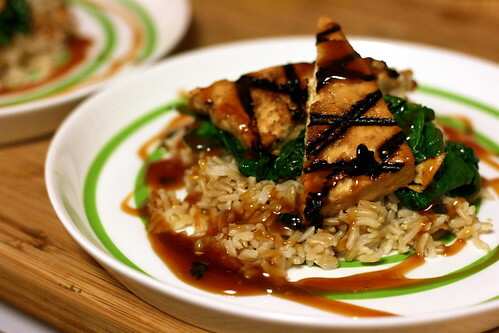 you can use any tofu marinade you like or can find on the web – this one has a mirin and soy base. I do have a few tips though! I used to be silly and toss my tofu marinade out, wishing I could do something with it. Here are two ideas that I used in this dish. 1. Place greens in a heated saute pan and dribble with a little of the marindate – use this for your flavoring, and you have a dish that goes very well with your tofu! 2. Remove the greens from the pan and add the rest of the marinade. It should start simmering quickly because there probably isn’t that much of it – don’t worry about the small amount. Mix a little bit of cornstarch with some water and pour into the pan, whisking constantly until a glaze forms. Drizzle this over the tofu and greens. Since marinades are usually strong, you’ll only need a little bit for the greens and just a drizzle of sauce. Probably this would have been a better dinner than chips and salsa. Looks great! I adore my cast iron skillet and grill pan. I actually was given a very expensive nonstick grillpan and returned it after the first use. It does compare t my $16 cast iron pan. The best money ever spent in my opnion. Food looks great as usual. The marinade tip is one I use all the time.. or I freeze it for further use or to add flavor.. oh, the beauty of not using flesh in your meals.. you can eat the marinade without worrying! That dish looks so posh! Even the grill marks look perfect. Mmmm, tofu. Sandy – Yeah. You were supposed to have dinner when you got home! Melody – I can tell I’m going to love mine for years. I never thought about not being able to use meat marinade (probably because the last time I ate meat I was too young to cook it! ), but that’s a good point! Bazu – Thank you! It’s amazing what a few grill marks can do! Sheree – Thanks! I was so excited to receive something that I actually wanted and will use for years. I can only hope to give others gifts as thoughtful as this one! You should buy VwaV! It’s definitely my most used cookbook!